Shata Chandi Homa is a procedure with offerings Goddess Chandika, by chanting the 700 verses of Devi Mahatmyam hundred times. This enables positive vibrations, neutralize negative forces and thoughts, overcome obstacles, ward off evil eyes, remove curses and cleanse the negative energy. Chandika or Durga is a combined avatar of Goddesses Parvati (Kaali), Lakshmi and Saraswati. According to Devi Mahatmyam, she is portrayed with eighteen arms, each holding a different weapon to ward off all the negativities and guard her devotees. She is the representative force of all and is endowed with tremendous limitless attributes. She is responsible for creation, sustenance and destruction. 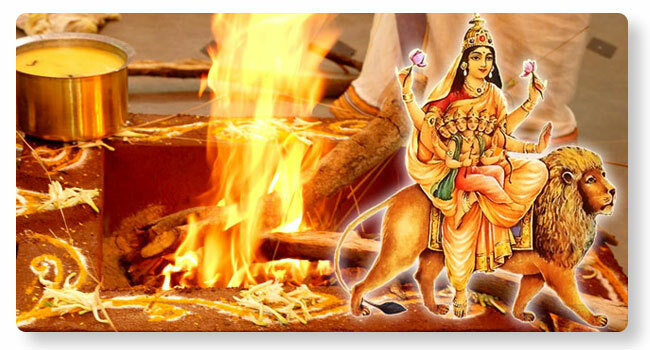 Shata Chandi homa is performed to get quicker remedies to all kinds of difficulties and problems in life and help achieve an all-round success. Homa helps remove the shroud of Ajnan (ill knowledge) and give a new direction or path to victory.